Its leap day so time to do or trying something different. 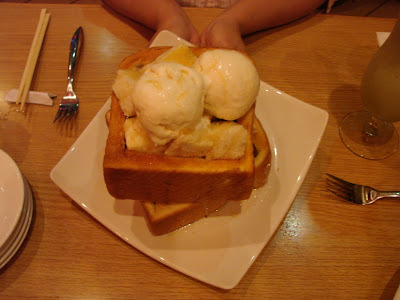 Pictures is the Shokudo Honey Toast. A perfect Leap Day dessert its two 3-inch high pieces of toast that are hollowed out, cubed, toasted and covered in honey and ice cream (you can also add caramel, cinnamon, chocolate or azuki beans). Fun to eat and fun to share with a friend. This entry was posted on Friday, February 29th, 2008 at 1:06 am	and is filed under Food, Hawaii Photo of the Day. You can follow any responses to this entry through the RSS 2.0 feed. You can leave a response, or trackback from your own site.